Today’s restaurant guests demand both speed and quality. In fact, some 91 percent of consumers say that offering value through quick, high-quality service is important to them at fast casuals, according to Technomic. For operators to deliver on that need means taking a look around the kitchen—beyond the ingredients. In addition to a 75-percent reduction in cook time, Scicchitano sees the ovens ($7,000 to $8,000 each) as an opportunity to promote consistency along with speed. With these ovens, “employees can’t serve product until the cooking cycle has ended, versus [without] when they can open the lid of the panini press and serve a sandwich that might not be finished,” he says. But when the right piece of equipment isn’t out there, some operators take matters into their own hands. Yalla Mediterranean, the seven-unit fast casual and sister concept of Daphne’s California Greek, couldn’t find a speedy conveyor-style grill that would rotate skewers as they cooked to-order, so Michael Mitsoglou, VP of operations, resorted to designing, patenting and producing a custom one. “It needed to be something that would bring the warmth of the barbecue four feet from the guest, together with the visual [experience] of watching the skewer move down the line and seeing the flames go up,” says Mitsoglou. The end result is a 600-pound stainless-steel grill that cooks each skewer in 1 1/2 to three minutes, with a capacity of 580 skewers per hour. The cost: $16,000, which Mitsoglou compares to the top 25 percent of ready-made grills he also considered. The money he saves on labor and decreased product waste justifies the cost, he says. “[In my experience,] the grill man is the one who has the highest per-hour salary because [he is] dealing with the most expensive product in the kitchen,” he says. 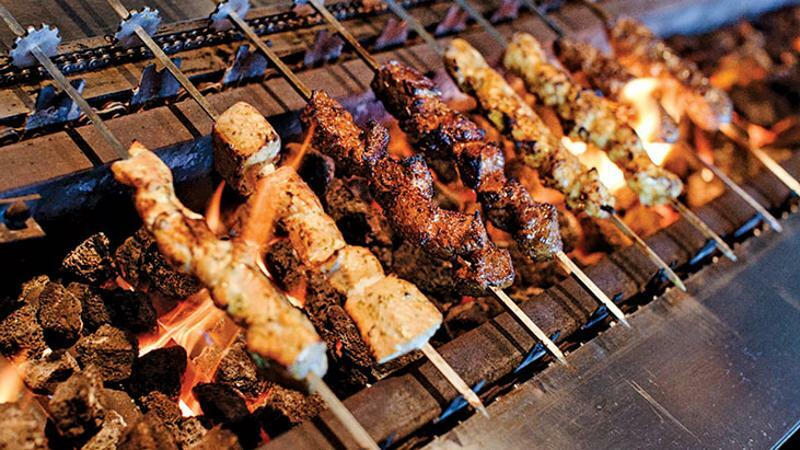 At Yalla, it’s an entry-level job and requires simply placing each skewer at the designated starting point on the grill.